The Myth of Moderation — Jay Williams Ph.D. Learn about the myth of alcohol moderation. 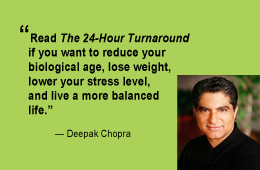 In The 24-Hour Turnaround TLC 5, I give you information to help you evaluate the effect of alcohol on weight loss, aging, optimal health and sleep. While the accepted wisdom for most people is that a glass of wine every evening is good for your heart, it may, in fact, be packing on the pounds and contributing to wrinkled skin. Chemically, alcohol acts as a diuretic and causes dehydration—just what you want to avoid to look and feel young. And research confirms that just one glass of wine inhibits your body’s ability to burn fat for the next 48 hours. But now you can learn how to turn this fat-burning condition aroundin the next 24 hours. I also unravel the “French paradox” and give strong evidence revealing that alcohol is linked to some types of cancer, as well as age-related diseases. AND if you are taking HRT, find out why you are at additional risk for breast cancer when you drink alcohol. Get Started Today: Alcohol Turnaround Tip. Skip your evening glass of wine and increase your body’s ability to burn fat and remove toxins during the next 24 hours. One of the first questions on my client profile form is, “Do you drink alcohol?” It’s ironic that I usually get the answer, “No. I only have wine or beer with dinner.” Read my lips: Wine and beer are both alcoholic drinks! A critical part of the interview process when a new client comes to me is determining whether she can limit alcohol to help accomplish weight loss, hormone balance and reverse aging. If the answer is no, then I ask her to rethink her priorities and resolve this need for alcohol, or I will not be much benefit to her. Not only are there life-threatening consequences associated with drinking alcohol, but that one little glass of wine is guaranteed to disrupt your deep, anti-aging sleep, and slow down your fat-burning mechanism. Alcohol’s empty calories also replace whole foods that have beneficial nutrients. And alcohol is known to be toxic in relationships and cause even the most cautious people to say things or act in ways that are out of character for their behavior. Alcohol is a targeted culprit in boosting blood pressure, and if you’ve been diagnosed with hypertension (high blood pressure), stopping alcohol consumption is one proactive step that will save your heart. In women, hypertension increases the risk of heart attack and cardiovascular disease by 25 percent, and more than half of all women over age forty-five have it, including millions of women who have undiagnosed hypertension. Hypertension makes your heart work harder than normal, increasing the stress on your heart muscle and arteries and leading to a thickened heart muscle, which can cause irregular heartbeats (arrhythmias). High blood pressure can also lead to atherosclerosis (plaque build-up in the arteries), putting you at high risk for a heart attack or stroke. In one of the studies reported in Hypertension, researchers concluded that a reduction in alcohol intake among drinkers significantly reduced their blood pressure. They found that when alcohol consumption fell by 16 to 100 percent, there were significant drops in systolic blood pressure (the top number in a blood pressure reading). 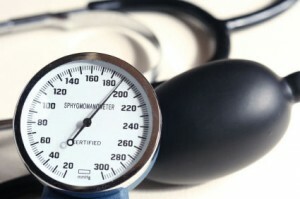 Diastolic blood pressure (the lower number) also dropped significantly in eight clinical trials. The greatest drop in blood pressure was seen among patients with the highest blood pressure before treatment and those who cut their alcohol consumption the most. It makes you wonder why doctors recommend drinking alcohol to reduce the risk of heart attack, when it increases the risk of hypertension, a major factor in cardiovascular disease. Perhaps this is truly the paradox. Regarding Alcohol — Drink very little, if any, alcohol. Alcohol consumption — even modest amounts — are associated with increased risk of breast cancer. "Is any consumption sufficiently moderate to protect us and others from the fruits of a dulled mind?" --Gavin Harrison, My teacher and dear friend.